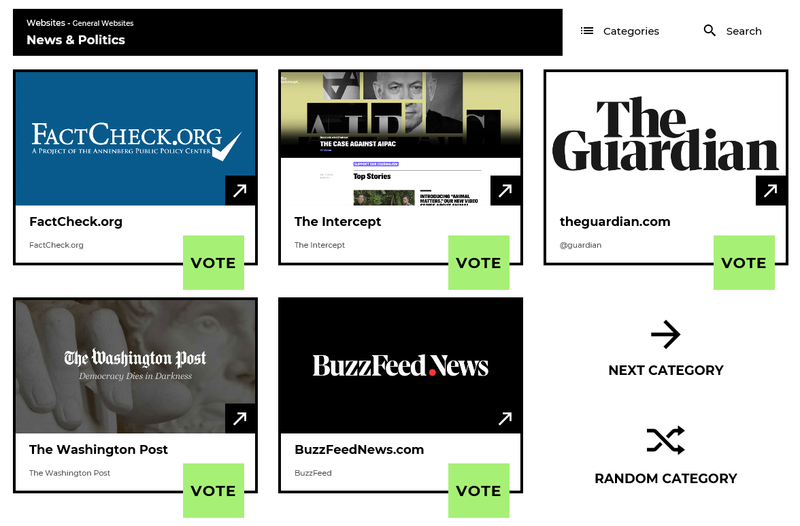 FactCheck.org again is among the five finalists competing in the category for Websites: News & Politics. The other nominees, which were first announced April 2, are the Washington Post, BuzzFeedNews.com, the Guardian.com and the Intercept. Fans of our website can vote for us to win the Webby People’s Voice Award up until the end of the day on April 18. Go to vote.webbyawards.com and use your email address to sign up and vote. Signing in using your Twitter or Facebook account is also an option. Last year, the judges for the International Academy of Digital Arts and Sciences selected FactCheck.org as the Webby Award winner in the News & Politics category. But the Webby People’s Voice Award — which is voted on by the public — went to PBS NewsHour, ending our streak of six consecutive wins. We’d like to start a new winning streak this year. Winners will be announced April 23.